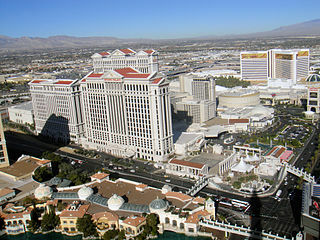 Caesars Palace is a luxury hotel and casino located on the Las Vegas Strip. Las Vegas slots players have a wide variety of options to choose from at Caesars Palace Las Vegas. You can play from 1� to $500 on your choice of traditional reel-type slot machines, video reels machine, the latest video poker games, video blackjack or keno. Win in spectacular fashion playing your favorite Las Vegas casino table games at Caesars Palace Las Vegas. When you're casino gambling in Las Vegas, the excitement rises as you face off with lady luck and test your skill with games of chance such as Blackjack, Craps, Roulette, Baccarat, Spanish 21, Mini-Baccarat, Pai Gow and Pai Gow poker. On game day, there is no better place in Las Vegas than our Race & Sports Book. The 'Home of Champions' buzzes with excitement as horse bettors and sports fans cheer their favorites while watching action from coast to coast. Honoring the indulgences of ancient Rome, Caesars Palace Las Vegas presents the best in culinary eats. Voted the No. 1 buffet in Las Vegas by USA Today, Bacchanal Buffet offers more than 500 items. Savor tastes from around the world while admiring the resort's stunning Garden of the Gods pool area. Caesars Palace offers an unforgettable dining experience with celebrity chef-owned restaurants. Gordon Ramsay Pub & Grill delights guests with upscale British pub food, a grill bar and beer options. Celebrity chef Bobby Flay brings his Southwestern cuisine and signature margaritas to Mesa Grill, the AAA award-winning Diamond restaurant. Bacchanal Buffet - Buffet - Bacchanal Buffet features more than 500 items prepared by a team of master chefs in nine globally-inspired open kitchens. Rao's - Upscale Italian - Come experience simple, honest, home cooking at Rao's at Caesars Palace, voted one of the best Italian restaurants in Las Vegas. NOBU - Upscale Japanese - The ideal destination to be seen, socialize, and enjoy the unique cuisine of celebrated Chef Nobu Matsuhisa. Gordon Ramsay Pub & Grill - Casual Cafe/Variety - Gordon Ramsay Pub & Grill is the neighborhood restaurant conceptualized by the award-winning chef. The 290 seat restaurant is the most authentic English pub experience in Las Vegas, as only a native UK chef can provide. Central by Michel Richard - Casual American - At Central, Chef Michel Richard serves American food with a French twist in a casual dining environment. For all the best restaurants in Las Vegas, try Caesars Palace. Old Homestead Steakhouse - Upscale Steakhouse - Old Homestead Steakhouse at Caesars Palace offers fine dining in a Las Vegas restaurant inspired by the original Old Homestead, one of NYC's most historic restaurants. Payard Patisserie & Bistro - Upscale French - The Payard Patisserie & Bistro at Caesars Palace, unique among Las Vegas restaurants, contains an upscale bistro as well as a chocolate and pastry shop. Serendipity 3 - Casual American - Serendipity 3, one of the great Las Vegas restaurants at Caesars Palace, serves fun and whimsical entrees and delectable desserts. Mesa Grill - Upscale Southwestern - Brought to Caesars Palace Las Vegas by celebrity chef Bobby Flay, Mesa Grill Southwestern Restaurant features bold flavors and specialty margaritas. Empress Court - Upscale Chinese - Dine on authentic Cantonese seafood at the Empress Court Chinese Restaurant, a premium Las Vegas restaurant at Caesars Palace Las Vegas. Cypress Street Marketplace - Quick Bites Cafe/Variety - Casual dining at Cypress Street Marketplace offers a wide variety of cuisines and specialty food. Find all the best Las Vegas restaurants at Caesars Palace. Beijing Noodle No. 9 - Casual Chinese - Beijing Noodle No. 9 offers Northern Chinese cuisine in a friendly, casual atmosphere. The best restaurants in Las Vegas can only be found at Caesars. Munchbar - Casual American - Come take a break at Munchbar, a Las Vegas restaurant and pub where you can find all your favorite comfort foods on a menu created by renowned Chef Bryan Ogden. Restaurant Guy Savoy - Upscale French - Restaurant Guy Savoy at Caesars Palace has been called the best restaurant in Las Vegas, serving elegant French Cuisine in a fine dining environment.